These tiny nature-inspired earrings are the perfect “go-to” pair that every boho chic woman needs in her life. 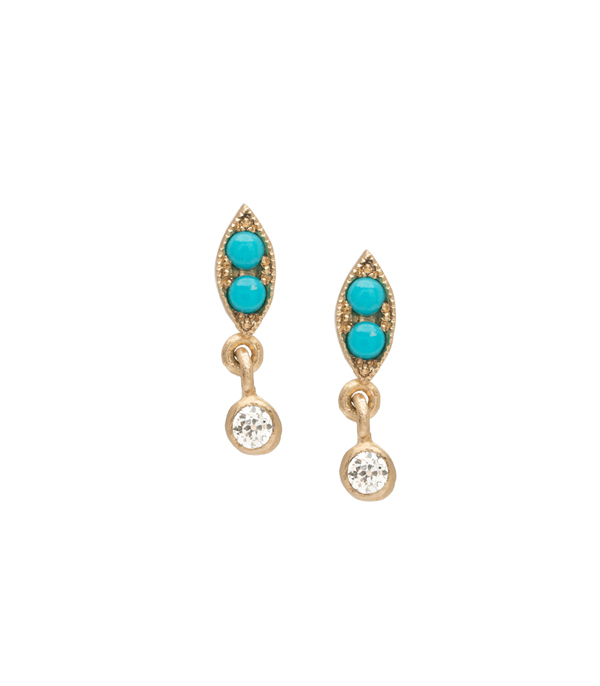 Eye catching turquoise cabochons set in solid gold are punctuated with diamond drops, dangling with every move. Wear these bohemian diamond earrings to grab your morning coffee with blue jeans and your broken-in loafers, or dress them up for an evening out and a classic chignon. These tiny earrings make a beautiful gift and a lovely bridal earring alike. Set with four turquoise cabochons and 0.10 ctw of sparkling white diamonds, these everyday earrings are hand crafted by our artisan jewelers in Los Angeles. Also available in various stone and color options. Please visit our Bespoke page to inquire. Categories: Alethea, Earrings, Something Blue.